James Harris Gallery | Efrain Almeida: "Trance"
James Harris Gallery is pleased to present “Trance”, our fifth solo exhibition by Efrain Almeida. 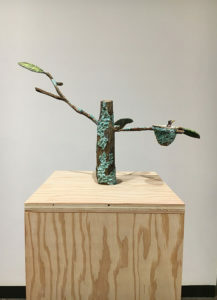 For this show, Almeida has moved away from the carved wooden pieces that he has created for many years, and brings to us, small sculptures made of bronze. 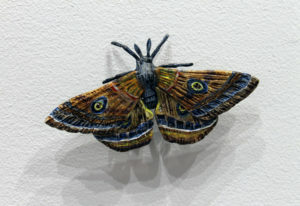 Taking the form of birds, butterflies, and moths, these life-size pieces are carved, cast, and then meticulously painted to give them a hyper-real quality and a powerful presence for this intimate scale. While highly mimetic, Almeida’s work is not merely representational, but an exploration of form as a psychological symbol. Almeida captures ephemeral moments and states of interstice in his work to lyrically address issues of sexuality, religion, nature, humanity and personal identity. “Trance” refers to a state of mind that is a half-conscious state, somewhere between reality and unreality, consciousness and unconsciousness. 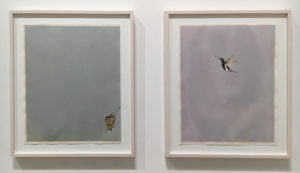 Birds and moths as a subject hold great meaning in art. They are symbols of freedom, of fragility, metamorphosis and transcendence. Almeida uses these works to convey all of these meanings to the viewer. 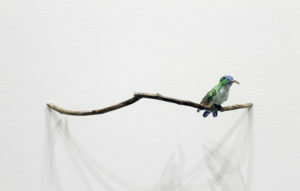 In the works Landing 1 and Landing 2, hummingbirds are delicately perched on a branch, a fragile suspension of action. 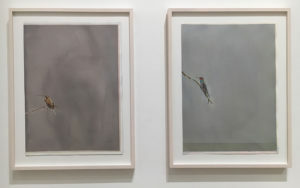 Almeida is interested in capturing frozen moments in time such as a “pause in flight”, which was the title of his exhibition at Paço Imperial in Rio de Janeiro last year that included similar forms. 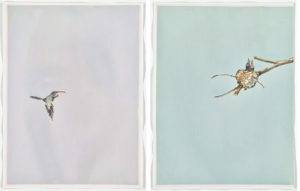 In his watercolor on paper series, Almeida depicts these birds in two dimensions. The stillness is palpable in these works. 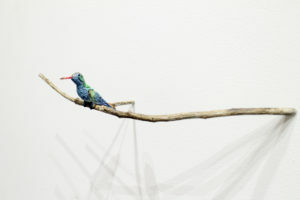 There is none of the suspense of the sculpture, though the viewer is captured in the same way. The subject matter is only the jumping off point in Efrain’s work. His practice is theatrical, expanding into the exhibition space and provocatively engaging the viewer with a baroque sensibility. 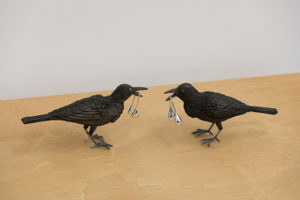 The palpable fragility of these constructed and crystalized scenes reference the tradition of memento mori, where the viewer is made aware of the ephemerality of the physical realm. Almeida has an enormous love for the trance that nature may bring to the onlooker, and the awe-inspiring encounter that occurs in the presence of natural forces. He uses this body of work to bring these states of transfixion within the gallery. Two pieces of 5 1/2" x 8" x 3" and 5 1/2" x 8 1/4" x 3"
12 1/2" x 21" x 9"
4 1/2" x 2 1/2" x 1/2"
13" x 6" x 2 1/2"